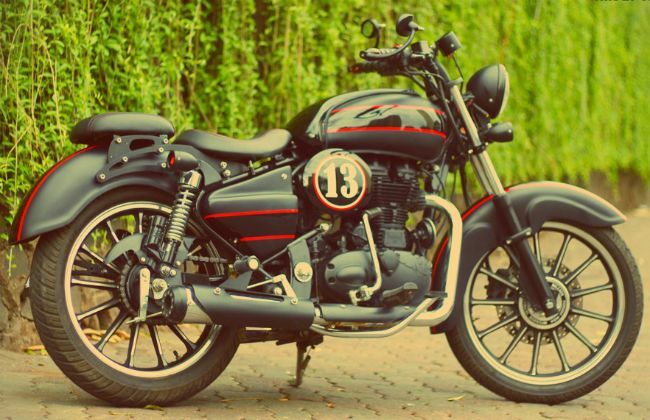 HomeNew BikesBike NewsBangalore: Vardenchi’s Range Of Customisation Kits Launched! Bangalore: Vardenchi’s Range Of Customisation Kits Launched! Customisation fanatics rejoice! Vardenchi has officially launched its range of motorcycle customisation kits and accessories in Bangalore. The brand, which specializes in modified Royal Enfields will offer its range of products as complete customisation packages, which allow buyers to choose from a pre-set package of parts, finishes and leathers, as well as paint and graphic designs. Last year, Vardenchi introduced its ‘Type 1’ series of body-kits which can now be purchased by Bangalore based bikers. While they were introduced as optional do-it-yourself kits, Vardenchi will now be fitting the parts at its own workshop directly. As per the official site, customers have a choice of 3 kits each, for the Classic and the Thunderbird. While the ‘Rebel’ and ‘Vintage’ kits are common to both models, the Classic is also available with the ‘Carbon’ package, while the Thunderbird can be had with the ‘hot rod’ kit. Depending on the package chosen, Vardenchi offers customized mudguards, side panels, handlebars and headlamp assemblies. The kits also include LED lighting systems and custom number plate casings, while alloy wheels and Pirelli tyres can be opted for as well. Customers will have to supply the bike themselves and any part replaced by a modified component will be handed back to the owners. While the prices of the customisation kits haven’t been announced, expect a starting price of around Rs 70,000. Vardenchi launched the custom packages at the Big Bear Customs showroom, located opposite the BMTC bus depot in Shantinagar, Bangalore.